The John Muir Award is an environmental award scheme that encourages people to enjoy and care for wild places. The Award is not competitive but should challenge each participant. Taking part will develop an understanding of, and responsibility for, a chosen wild place or places. Four challenges are at the heart of each John Muir Award. There are three levels to the Award, encouraging progressive involvement. At Essex Boys and Girls Clubs we run the John Muir Award during our America Challenge. The Discovery challenge is completed in the UK in the preparation for the trip, when participants find out everything they can about the legendary Appalachian Trail. The Exploration challenge is completed during a 7 day hike through the Great Smoky Mountains National Park, making our way along 70 miles of the Appalachian Trail. 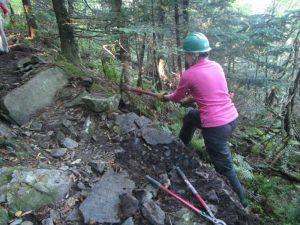 The Conservation challenge is completed during a 7 day session volunteering with the Rocky Top Trail Crew, part of the Appalachian Trail Conservancy. The Sharing challenge is completed during the following 3-5 days visiting and volunteering with nearby schools and the Boys & Girls Clubs of America clubs. It continues back in the UK when participants are expected to deliver a presentation to their club. 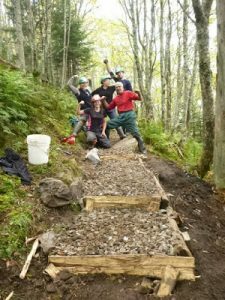 Participants on the America Challenge 2015 helped to conserve the Appalachian Trail by learning to build steps of wood and rock, made with hand-crushed gravel. This activity diverts and manages water as it runs off the mountains, reducing erosion of the trail and impact on the surrounding wilderness. The benefit to individual of the John Muir Award’s requirement to place the Conservation phase after the Discovery and Exploration phase is clearly visible on the America Challenge. As the group works on the trail, passing hikers stop to thank the team for their work. Many hikers have seen the group’s hiking entries in the shelter logbooks and know that the Brits are on the trail. The participants and leaders are struck repeatedly by the positive impact of their work. America’s National Park Service values volunteer labor at only about $9/hour, which is a low figure in reality, especially for work that is so remotely located. So with 56 hours per person x 8 people that makes $4,032 for the value of the group’s labour in 2015. However, the Park Service also places a value on the construction of trail structures. This number is meant to account for all the costs associated with building the structure, including labor (so it is not added it to the earlier figure). The total value of the structures built on our Session last year was $38,717.46, a much more impressive number! The true value of this volunteering is impossible to attach a figure to, linked as it is with raising awareness, supporting personal development and strengthen international links. 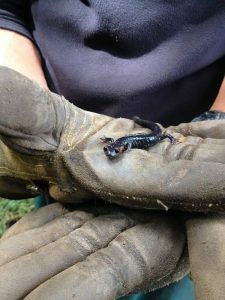 There is an ongoing impact for the Appalachian Trail Conservancy, the National Park Service, the Boys & Girls Clubs of America and the volunteers themselves. When our British butterflies flap their wings in the wild there is a ripple around the world!